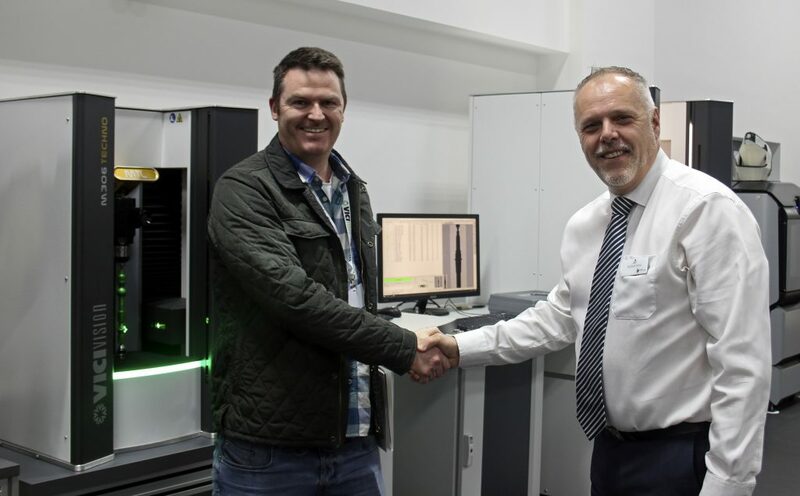 A CNC machining company says it has taken its product inspection capabilities to ‘the next level’ by investing in a world-class optical measurement solution. HPC Services Ltd, which turns out millions of precision parts annually for industrial equipment such as printing machinery and train braking systems, has added a VICIVISION M306 to its ranks – a non-contact turned-part metrology system for improving production efficiency. The deal was signed during the inaugural Manufacturing Performance Network (MPN), a three-day event hosted by VICIVISION UK’s parent company the Carfulan Group at its state-of-the-art headquarters near Derby. HPC Services Ltd owner and MD Paul Cobb (left) shakes hands with VICIVISION UK Sales Manager Graham Shaw after agreeing a deal for an M306 system. Paul Cobb, owner and Managing Director of Ilkeston-based HPC Services Ltd, believes the M306 will deliver multiple benefits to both his business and its customers. He said: “We make 4,000 different parts and have 17 people measuring parts alone. If we’re going to be cost-competitive in the UK, we have to automate not only our manufacturing but also our inspection. “We want to give ourselves and the customer more confidence that what we’re making is correct. Instead of measuring one in 100 parts, now we can measure every one if we want to – the VICIVISION will cover every size part that we make. “The fact that the M306 will give us an automated database of threads right there is amazing. Currently, if customers want parts in a week and it takes us a month to get a thread gauge, we’re in trouble. VICIVISION UK Sales Manager Graham Shaw said: “We specialise in helping our customers to achieve complete control over their production processes and we’re delighted to be working with HPC Services Ltd.
“The MPN was a fantastic opportunity for visitors to really experience the power of our technologies through live demonstrations and conversations with our experts. “Through the intuitive non-contact inspection of cylindrical parts, VICIVISION UK solutions save businesses time and money, increase throughput and improve the quality of what they produce. By using superior high-resolution technology to carry out a number of checks on a single set-up, VICIVISION systems ensure there is no need for multiple specific instruments such as co-ordinate measuring machines or handheld gauges. Even the most complex cylindrical parts – such as impellers, camshafts, dental implants and trauma screws – can be inspected in a matter of seconds, down to the last minute detail, giving manufacturers a competitive edge.